ST. MATTHEW'S PARISH CHURCH, BORTH. EGLWYS ST MATHEW Y BORTH. (This information is mostly obtained from A Brief History of St. Matthew's, Borth, compiled in 2001 by Dr John Norrington-Davies. Details regarding chapels comes from the Genuki web-site. Other information is drawn from Gerald Morgan, Ceredigion : A Weath of History, 2005). The Village and the Chapels. The growth in the nineteenth century of Borth as a popular and fashionable seaside resort as well as a sea-going and fishing village, saw several places of worship flourish. Regrettably, most of these are now closed. The cause of the Calvinistic Methodists was strong, seeing the foundation of Soar chapel in 1803 and of Borth chapel in 1831. The former became for a period Our Lady Star of the Sea Roman Catholic church, the latter served until recently as a shop. Both are now closed. Gerlan (Libanus) Welsh Calvinistic Methodist chapel (now the Presbyterian Church in Wales) commenced as a Sunday School in 1801, the present building dates from 1892 now closed. So far as members of the Anglican Church were concerned, Borth lay in the parish of Genau'r-Glyn (Llandre). It was to that parish church two miles distant that for generations the inhabitants were expected to resort for divine worship. Fortunately, by private subscription, a church school was opened in Borth and used for Anglican servces with effect from 16 March 1842. For a number of years there were five weekly services: two in Welsh and three in English. The school was supported in part by means of an annual grant from the National Society for Promoting Religious Education and therefore, like many others, was commonly known as the National School. In 1847, a few years after its opening, the survey of education in Wales known as the 'Blue Books', referred to Borth school as 'a sightly and substantial building in excellent repair'. It closed very sadly in 1967, but the foundation stone is built into the medical centre now on the school site. 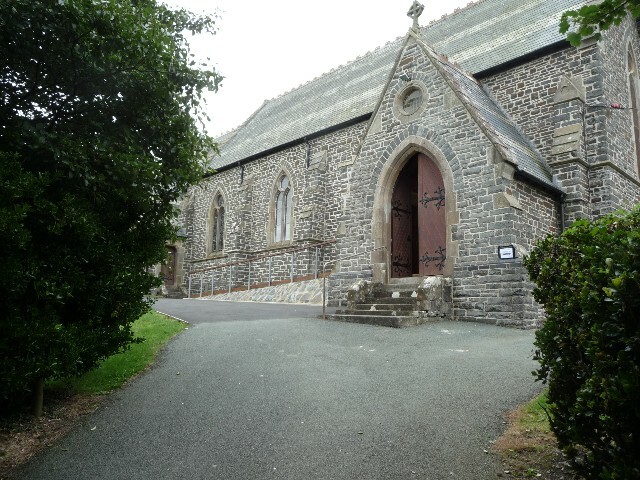 The need for a permanent church building became obvious by the later nineteenth century, especially as the opening of Borth railway station in 1863 brought additional holiday makers. A building committee was set up which in 1874 approved the plans for the proposed church of Archibald Ritchie, a Chester architect. The builder appointed was John Tudor of Trawsfynydd, and his clerk of works, was L.C. Jones of Borth. The building is of local stone, with dressed stone from the Grinshill quarries in Shropshire, while the roof was to be tiled in blue Welsh slate. The building cost over £2,000: some £90,000 in modern equivalent. The site of the church could not be in Borth village as sand and shingle were insufficent foundations for a weighty building, but fortunately the rocky outcrop on which St.Matthew's now stands was sold to the building committee by Sir Pryse Pryse, together with adjoining land, for £30. 'Gentlemen connected with the railway' were among the members of the building committee; but as the railway preceded the church in time, an enduring legacy is that the onus of safety precautions in crossing the line falls on the church members and other users of the church lane, rather than with the railway authorities. The foundation stone of St.Matthew's was laid on 18 November 1874 after luncheon in the Cambrian Hotel (now the site of the tourist office) and a sermon in the school by the new bishop of St David's, the Rt. Revd. Basil Jones. (The bishop owned the Gwynfryn estate in nearby Llangynfelyn, and it is highly likely that he actively supported the plans for Borth church as for the iron church at Talybont a few years later). Despite poor weather, the assembled company proceeded to the church site where Lady Pryse with a silver trowel spread the mortar before tlle stone was lowered into position. Dr Norrington Davies tells how in a small cavity under the stone lies a glass bottle in which are enclosed' several coins of the realm, a small view of the proposed church, and the names of the building committee'. The day ended with a public tea, and Evensong in Welsh in the school. An outbreak of typhoid at Uppingham School in Rutlandshire meant that the entire school body was evacuated to Borth on 4 April 1876, and there remained for three terms. This hastened work on the new church building in which services were held for the first time on Trinity Sunday, 20 June. The preacher in the morning was the headmaster of Uppingham, the redoubtable Revd. Edward Thring, who took for his text: 'My house shall be called a house of prayer'. In the afternoon a further service had a sermon in Welsh and in the evening an address in English. Welsh services, as well as English, were held in St.Matthew's until comparatively recently, and as recent Census returns show that over 40% of Borth inhabitants speak Welsh, and the children learn the language in all schools, this seems apt. The boys had each Sunday two services in St.Matthew's in between the parochial services. The recollection of one old boy was that the first service the school attended in the church was a confirmation conducted by Bishop Basil Jones. The school choir within weeks gave two concerts to help clear the debt on the church. At school services the church was literally packed out. The church was formally consecrated, and dedicated to St.Matthew, the apostle and evangelist, on Monday 15 September 1879 (135 years ago) by Bishop Basil Jones. Before the service (Matins followed by the Eucharist) the bishop walked in procession to the church door, together with the clergy and officials, reciting the words of Psalm 24: 'The earth is the Lord's ..'. Further services were held in the afternoon and evening. The churchyard was consecrated in 1892. It is worth noting that in the summer of 1878 a holiday-maker, coming in to see the new church, fled promptly when he saw a large snake coiled up by the lectern! As for the area St.Matthew's served it could not become a separate parish, and gain its independence from Llanfihangel Genau'r Glyn, until it was sufficiently endowed. The necessary sum was raised partly from the Ecclesiastical Commissioners and Queen Anne's Bounty, but also by public subscription, Miss Lewis (2 The Terrace, Borth) giving no less than £1,000 [well over £50,000 in to day's values]. The benefice of Borth was created by Order in Council dated 11 October 1912; until that date it was served by a succession of curates under the direction of the vicar of Llandre. The Windows (based on Dr Norrington-Davies' comprehensive description). There are no less than eleven stained glass windows adorning St.Matthew's, of which the east window was given by former pupils of Uppingham School in 1925, they fearing that the connection between Uppingham and Borth might fade away. The window was made by Whitefriars, London (note the small white friar in the bottom right hand corner), and dedicated at a special service on Tuesday 23 June 1925, by Bishop John Owen of St David's, the lesson being read by the headmaster of Uppingham, the Revd. R.H. Owen, and the sermon being preached by an old boy of the school, Chancellor W.C.E. Newbolt, of St Paul's Cathedral. The theme of the window is Faith: the centre light depicting Christ ('the author and finisher of our faith'); the north light, Abraham ('who set out not knowing where he went'), and the south light, Moses ('by faith enduring as seeing Him who is invisible'). The three upper lights depict the seals of the dioceses of St David's and of Peterborough (in which see Uppingham is located), and the seal of Uppingham School. Nave (north windows): Christ healing the leper (in memory of R.J.O. Jones; Celtic Studios, 1962); The Resurrection (in memory of Creswick and Emily Williams; Shrigley and Hunt, Lancaster, 1959); Christ as a Child in the Temple (in memory of Annie M. Bathurst, headmistress of the National School; Whitefriars, 1924). The Organ: built before the end of the 19th century by Nicholson of Walsall, it is a two-manual instrument with pedals, and was hand-blown up to the end of World War 2. For forty-four years, Michael James, FRCO, has been the sole organist, despite the afiliction of blindness. The Pelican Lectern: where a pelican is seen feeding her young with blood from her own breast; it reminds us of our Saviour shedding His blood upon the Cross. (Given by Charlotte Hunt of Badsey Vicarage, Worcestershire; 25 August 1878). The Pulpit: erected in 1920 in memory of the Fallen of the Great War. It bears a carved figure of St.Matthew, the church's patron saint. (Two new prayer desks were inserted at the same time, and the oak choir stalls in 1922). The War Memorial: shows that the majority of the Fallen from Borth, in both World Wars, served in the merchant navy. The British Legion standard was laid up in the 1980s. A new Borth branch has since been formed. The Credence Niche: on which the bread and wine were placed in preparation for the Eucharist is now partly concealed by the oak panelling. The Eucharistic Vestments: were the gift of tile vicar, Canon G.K. Williams, in 1976, as was the crucifix to the right side of the altar, it being that presented him by his sister when he was ordained. The large brass candlesticks were given in memory of Mr and Mrs Richard Folkes and to mark the induction of the Revd. Gordom Armstead as vicar in 1986. The Sanctuary Light: given by the parishioners in 1995 in thanksgiving for the twenty year ministry of Canon G.K. Williams (vicar, 1960-1980); designed and constructed by Mr J. Goodband (who also made the altar rail extension donated by Borth Carnival Committee in 1999). The Church Bell: given in 1928 by the local branch of the Girls Friendly Society. Weighing 4 cwt. 1 qr. 19 Ibs., it was made by Messrs. Mears and Stainbank. It replaced an existing bell, only 50 lb. in weight, which the faculty directed be hung with the new and used as a minute bell. The Sunday School Room (in the churchyard): pleasingly renovated in 2008-2009; much of the work being done by the teachers, parents, grandparents and villagers. The New Entrance and Disabled Access: facilitated by County-Councillor Ray Quant, and installed in 2009 by David Leigh of Aberystwyth. Much else has been accomplished in the church in recent years, including a complete renovation, and the introduction of a hearing loop system.